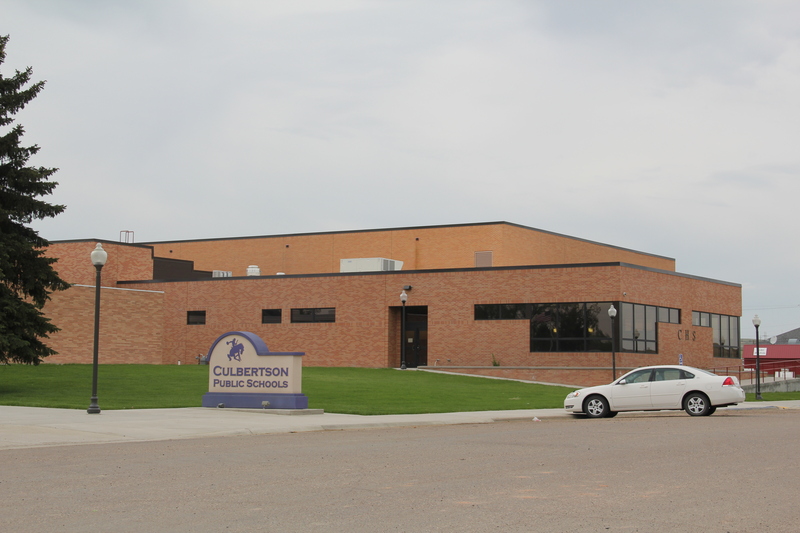 It has been five years since I revisited the historic built environment of northeast Montana. My last posting took a second look at Wolf Point, the seat of Roosevelt County. I thought a perfect follow-up would be second looks at the different county seats of the region–a part of the Treasure State that I have always enjoyed visiting, and would strongly encourage you to do the same. Grain elevators along the Glasgow railroad corridor. Like Wolf Point, Glasgow is another of the county seats created in the wake of the Manitoba Road/Great Northern Railway building through the state in the late 1880s. Glasgow is the seat of Valley County. The courthouse grounds include not only the modernist building above from 1973 but a WPA-constructed courthouse annex/ public building from 1939-1940 behind the courthouse. The understated WPA classic look of this building fits into the architectural legacies of Glasgow. My first post about the town looked at its National Register buildings and the blending of classicism and modernism. Here I want to highlight other impressive properties that I left out of the original Glasgow entry. St. Michael’s Episcopal Church is an excellent late 19th century of Gothic Revival style in Montana. The town has other architecturally distinctive commercial buildings that document its transition from late Victorian era railroad town to am early 20th century homesteading boom town. Register-listed Rundle Building. The Rundle is truly eye-catching but Glasgow also has a Mission-styled apartment row and then its historic Masonic Lodge. 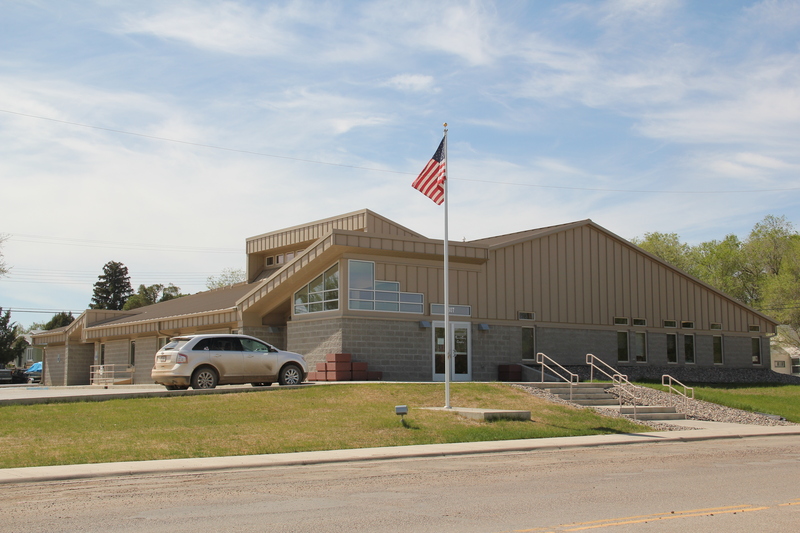 and on to Valley County Fairgrounds which are located on the boundaries of town. Another key public institution is the Valley County Pioneer Museum, which proudly emphasizes the theme of from dinosaur bones to moon walk–just see its entrance. The museum was a fairly new institution when I first visited in 1984 and local leaders proudly took me through the collection as a way of emphasizing what themes and what places they wanted to be considered in the state historic preservation plan. Then I spoke with the community that evening at the museum. Not surprisingly then, the museum has ever since been a favorite place. Its has grown substantially in 35 years to include buildings and other large items on a lot adjacent to the museum collections. I have earlier discussed its collection of Thomas Moleworth furniture–a very important bit of western material culture from the previous town library. In the images below, I want to suggest its range–from the deep Native American past to the railroad era to the county’s huge veteran story and even its high school band and sports history. A new installation, dating to the Lewis and Clark Bicentennial of 2003, is a mural depicting the Corps of Discovery along the Missouri River in Valley County. The mural is signed by artist Jesse W. Henderson, who also identifies himself as a Chippewa-Cree. The mural is huge, and to adequately convey its details I have divided my images into the different groups of people Henderson interprets in the mural. Hill), are just two of the reasons to stop in Glasgow–it is one of those county seats where I discover something new every time I travel along U.S. Highway 2. For sheer scale and audacity nothing in Montana built environment rivals the transformations wrought on the Missouri River and the peoples who for centuries had taken nourishment from it than the construction of Fort Peck Dam, spillway, powerhouse, reservoir, and a new federally inspired town from the 1930s to the early 1940s. The mammoth size of the entire complex was just as jaw-dropping to me as it had been to the New Dealers and most Americans in the 1930s. That same spillway, for instance, had been the subject of the famous first cover of Life Magazine by Margaret Bourne-White in 1936. When she visited in 1936 the town of Fort Peck housed thousands but once the job was over, the town quickly diminished and when you take an overview of Fort Peck, the town, today it seems like a mere bump in what is otherwise an overpowering engineering achievement. Coming from a state that had headquartered another New Deal era transformation of the landscape–the even larger Tennessee Valley Authority project–I understood a good bit of what Fort Peck meant as I started my work for the state historic preservation plan in 1984. A good thing I knew a little because outside of a Montana Historic Highway marker and a tour of the power plant there was little in the way of public interpretation at Fort Peck thirty years ago. First came efforts to better interpret the Corps of Discovery and their travels through this section of the Missouri River 15-20 years ago. The theme was Lewis & Clark in the Missouri River Country, but by the 2010s the region’s demanding weather had taken its toll on the installation. At the lake’s edge are additional markers encouraging visitors to imagine the time before the lake when the Big Dry River often meant exactly what it said–the reservoir keeps it full now. New interpretive markers combine with a well-defined pull-off to encourage travelers to stop and think about the loss of life that occurred in building the dam. Many of the massive infrastructure projects of the New Deal have similarly sad stories to tell–but few of them do. You can explore the landscape with the assistance of the highway markers to a far greater degree than in the past. Even if today it is difficult to “see” the transformation brought about by the massive earthen dam, there are informative markers to help you. workers and families were here in the worst of the Great Depression years and it is impossible to imagine this challenging landscape as once lush with thick vegetation and dinosaurs. Through fossils, recreations, artwork, historic photographs, recreated buildings, and scores of artifacts, the new interpretive center and museum does its job well. Not only are the complications of the New Deal project spelled out–perhaps a bit too heavy on that score, I mean where else do you see what the “Alphabet Agencies” actually meant–but you get an understanding of worlds lost in the name of 20th century progress. Is everything covered? Far from it–too much in the new public interpretations focuses on 1800 to 1940, and not how Fort Peck has the harbinger of the Cold War-era Pick-Sloan Missouri Basin reject that totally transformed the river and its historic communities. Nor is there enough exploration into the deep time of the Native Americans and what the transformation of the river and the valley meant and still means to the residents of the Fort Peck Indian Reservation. There’s still work to be done to adequately convey the lasting transformation that came to this section of Montana in the mid-1930s. 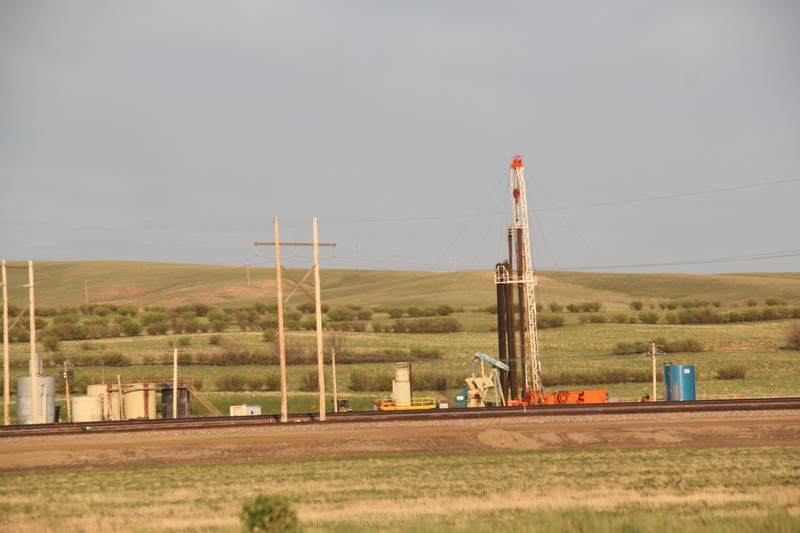 The 21st century boom in the Williston Basin has significantly reshaped western North Dakota, and as that region “fills up,” the boom has spread into far eastern Montana, especially along the Hi-Line corridor of U.S. Highway 2 and the historic Great Northern Railway. 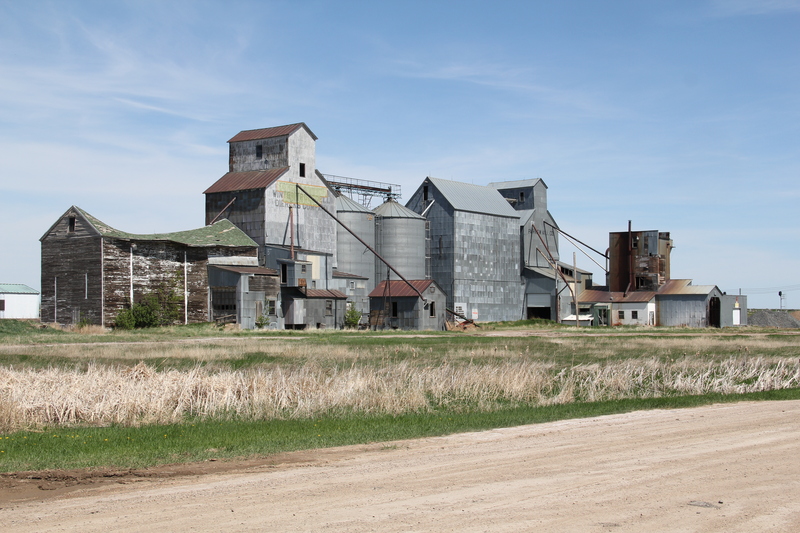 The photo above is along U.S. 2 on the outskirts of the tiny town of Bainville, the first place of any size you encounter as you travel west along the highway, or railroad, into Roosevelt County. 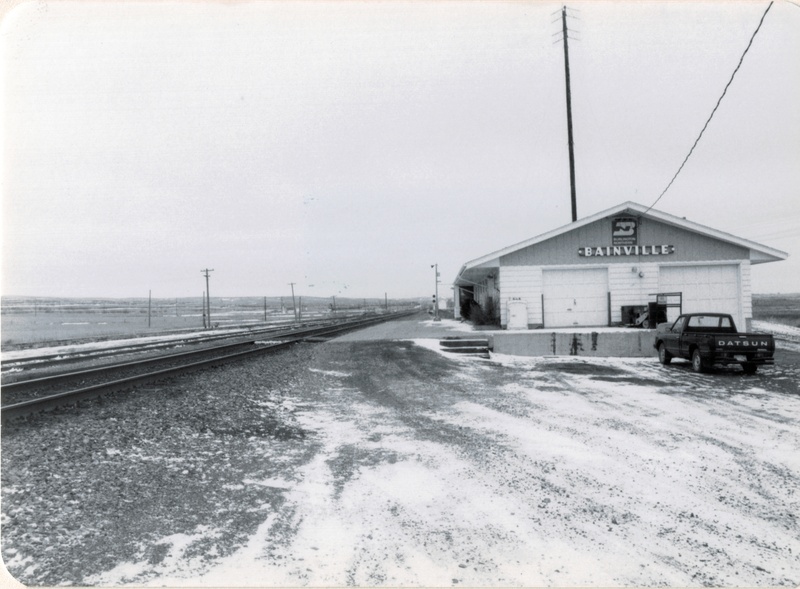 When I visited Bainville in early 1984 I recorded a town in decline. True, its 1950s modernist passenger depot was still there, but there had been a steady drop in population for decades. Thirty years later, the remnants of that decline were still there: abandoned brick neoclassical-styled bank; an elevator complex on the verge of collapse. But signs of new growth were there as well in 2013. 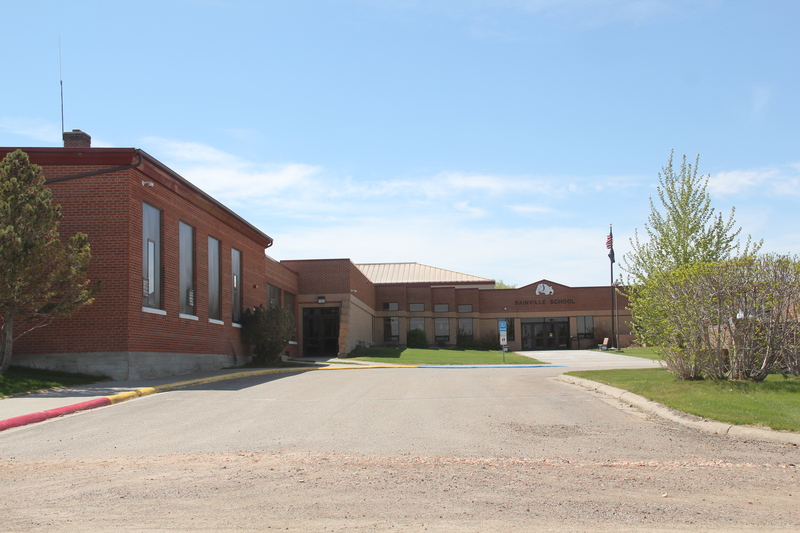 The recently expanded public school was one thing while the large man camp then under construction just east of the town was another–and a project that really concerned local residents since the camp’s population would be larger than the town itself. 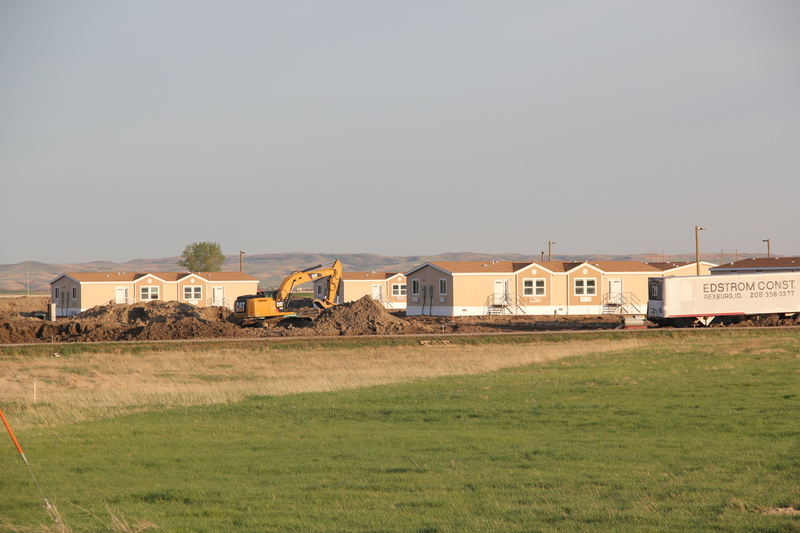 The next town west on the Hi-Line is Culbertson, where the impact of the Williston Basin was even more noticeable. 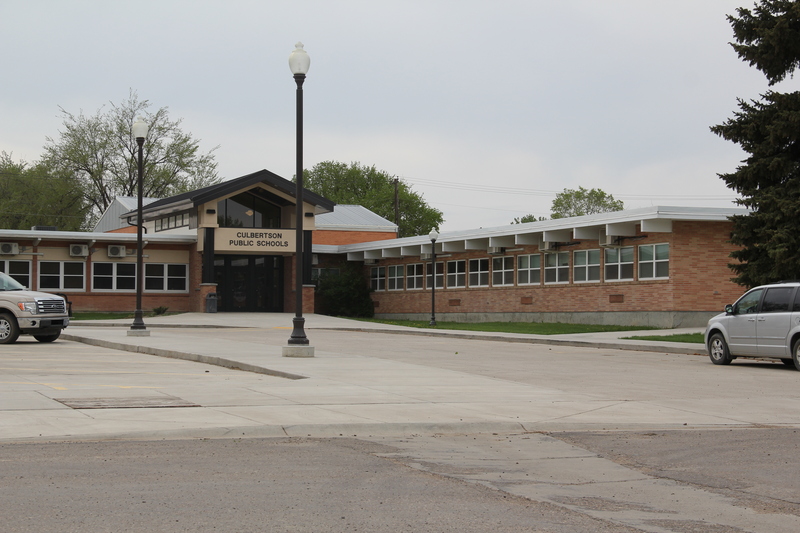 A modern school complex had replaced one that dated to the New Deal. 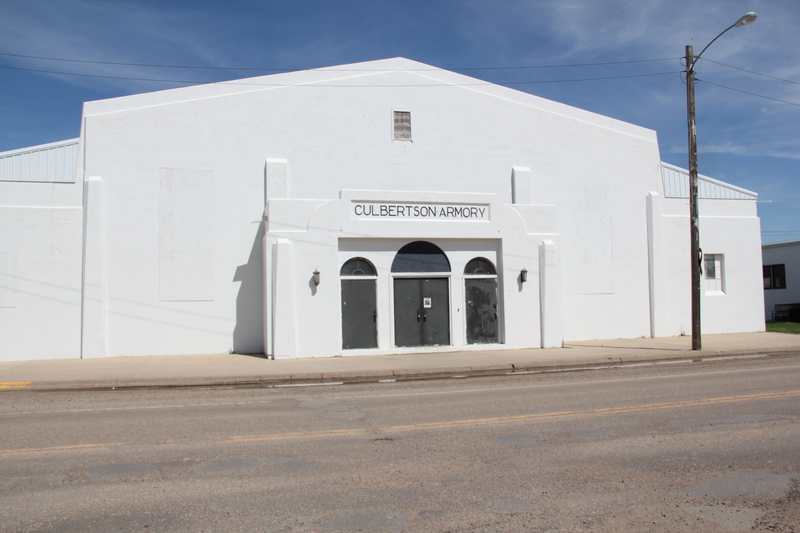 Indeed the New Deal’s once profound impact on Culbertson–a public office building and armory–had been eclipsed not only by the modern school but also a new county office building all shiny and bright. 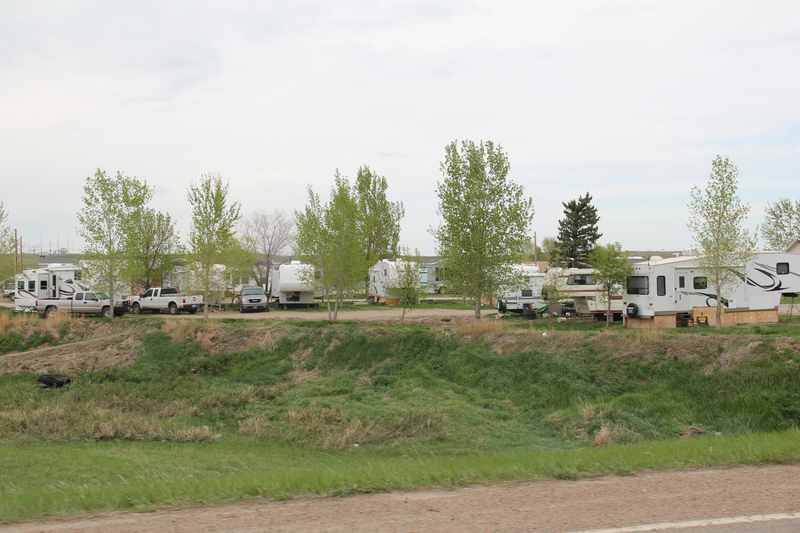 The man camps were already taking available land, even becoming a village in itself between the town’s historic cemetery and the railroad tracks. 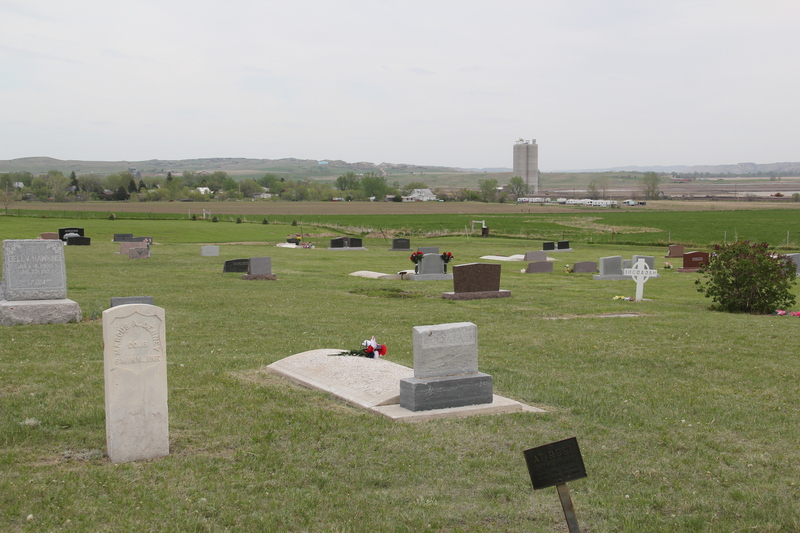 To capture the burial site of Civil War veteran Marcus A. Denney of the 6th Minnesota Infantry in the foreground and the man camp in the background by the elevators creates a snapshot, literally, of the periods of change in Culbertson over 150 years. 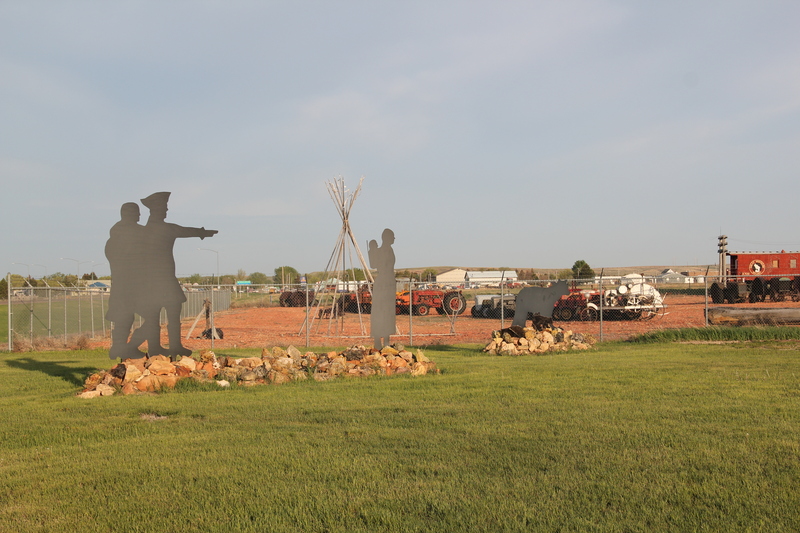 Truckers and workers flying along U.S. Highway 2 in past decades would have spied the metal sculptures of Lewis and Clark near the local museum–but these iconic figures are no longer what immediately captures your eyes as you speed along the corridor. 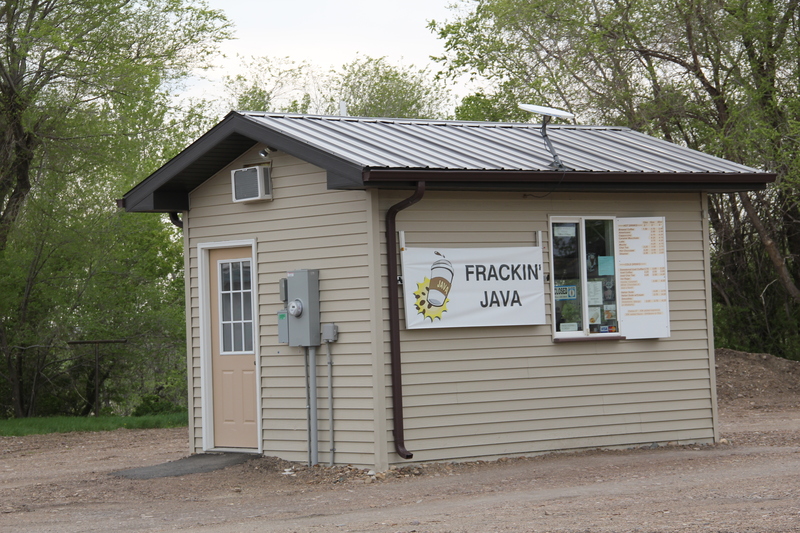 What you notice is everyone lined up for that human fuel that powers the commute between man camp and tracking well: the Frackin’ Java coffee stand. A true sign of the times along the eastern gateway of U.S. 2 in Montana. The Montana State Capitol was my first heritage project in the state–the Montana Department of General Services worked with the Montana Historical Society to have me prepare an interpretive guide to the capitol, and then set up the interpretation program, following an excellent historic structures report prepared by the firm of Jim McDonald, a preservation architect based in Missoula. The capitol was designed by the firm of Charles Bell and John Kent of Council Bluffs, Iowa, who moved to Helena to supervise the project. The first phase of construction dates from 1899 to 1902 and then between 1909 and 1912 the building was largely completed to its present form with additions from the Billings firm of Link and Haire. It was a splendid building and a joy to work with, and clearly a point of pride of the thousands of Montanans who would visit in a given year. When I worked at the capitol, of course I passed daily by other state government buildings, and rarely gave those “modern” buildings another thought, except perhaps for the museum exhibits and archival collections at the Montana Historical Society. Years later, however, what seemed unbearably recent in the early 1980s were now clearly historic. One of my MTSU graduate assistants, Sarah Jane Murray, spent part of a summer last decade helping develop a inventory of the buildings and then, finally, in 2016 the Montana State Capitol Campus historic district was listed in the National Register of Historic Places. the Great Falls architect George Shanley. The initial highway building now houses the departments of livestock and agriculture. The Capitol Annex (1910) was the first building added to the capitol campus, and its restrained classicism came from the firm of Link and Haire. The nearby Livestock Building (1918) is like the annex, complimentary of the capitol’s classicism but also distinguished in its own Renaissance Revival skin. Link and Haire were the architects. The mammoth Sam W. Mitchell Building (1948-50) reflected the post-World War II interpretation of institutional modernism and its mammoth scale challenged the capitol itself, especially once a large addition was completed at the rear of the building in 1977. The architect was Vincent H. Walsh of Helena. Another Link and Haire building on the campus is the Board of Health Building (1919-1920), which continues the pattern of more restrained architectural embellishment that shaped the look of the government buildings in the middle decades of the century. The Cogswell Building (1954-55, 1981) is another Vincent H. Walsh design, again reflecting the stripped classicism institution style often found in Cold War era public buildings. While the capitol campus took form on a hill about a mile east of Last Chance Gulch, the state’s governor still lived downtown, in the Queen Anne-style “mansion” originally built by miner and entrepreneur William Chessman and designed by the St. Paul firm of Hodgson, Stem and Welter. The state acquired the house in 1913 to serve as the residence for the governor and his family, and it remained the governor’s “mansion” until 1959. It was the opportunity to be the curator of this house museum that attracted my newlywed wife Mary Hoffschwelle that led me to come with her to Montana. She was born in Billings; I had never been west of Dallas. But then over 25,000 miles of driving, visiting, and looking in Montana transformed me, and led not only to the 1986 book A Traveler’s Companion to Montana History but now this Montana historic landscape blog. Fate, perhaps. Luck–I will take it any day. City as one large tourism funnel. After spending a good part of 2006-2007 working with local residents and the Great Smoky Mountains National Park about the heritage and preservation of Gatlinburg, Tennessee–one of the most notorious gateways into any national park–I learned to look deeper than the highway landscape and find some real jewels in each of these Glacier National Park gateway communities. There is much more than the highway to Columbia Falls, as the three building blocks above indicate, not to mention the lead image of this blog, the town’s Masonic Lodge which has been turned into one huge public art mural about the town’s history as well as its surrounding landscape. Go to the red brick Bandit’s Bar above, and you soon discover that Columbia Falls has a good sense of itself, and even confidence that it can survive new challenges as its population has soared by over 2,000 residents since the 1980s, totaling over 5,000 today. Once solely dependent on the Montana Veterans’ Home (1896), which is now a historic district, and then relying on the Weyerhaeuser sawmill for year round employment, Columbia Falls faces a different future now once the mill closed in the summer of 2016, taking away 200 jobs. As the historic business buildings above indicate, historic preservation could be part of that future, as the downtown’s mix of classic Western Commercial blocks mesh with modern takes on Rustic and Contemporary design and are complemented, in turn, by historic churches and the Art Deco-influenced school. Once you leave the highway, in other words, real jewels of turn of the 20th century to mid-20th century design are in the offing. In 1984–I never looked that deep. At Hungry Horse, however, I did leave the highway and explored the marvelous landscape created by the Hungry Horse Dam and Reservoir, a mid-20th century project by the U.S. Bureau of Reclamation. The agency justified the dam as a hydroelectric power project for a growing Flathead County and as a boost to local irrigation. The irrigation side of the project–the real reason the agency exists–never happened and Hungry Horse today is an electric power and recreational project. I appreciated the vastness of the concrete arch dam–the 11th largest concrete dam in the United States–as well as the beauty of Hungry Horse Reservoir, an under-appreciated tourism asset as anyone in Flathead County will tell you. But again, I let just the size and impact of the dam distract me from some of the details of its construction that, today, are so striking. Here I am thinking primarily of the contemporary design of the Visitors Center–its stone facade suggesting its connection to the now covered river bluffs but the openness of its interior conveying the ideas of space associated with 1950s design. I am concerned, however, about news in September 2015 that Reclamation has contracted for updates and renovation at the Visitor Center–let’s hope that the classic 1950s look of the property is not sacrificed. 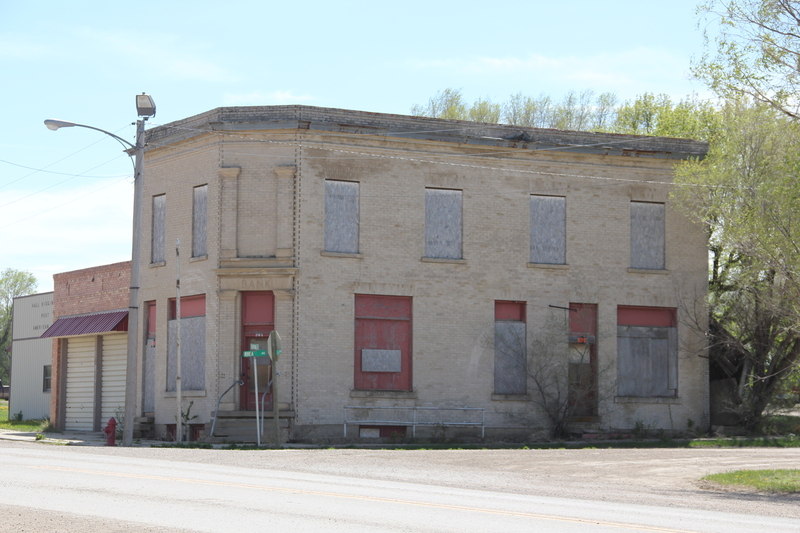 Martin City is just enough off of U.S. Highway 2–it is situated more on the historic Great Northern Railroad corridor–to miss out on the gateway boom of the last 30 years, although with both the Southfork Saloon and the Deer Lick Saloon it retains its old reputation as a rough-edged place for locals. For railroad travelers in the first half of the 20th century, West Glacier was THE west gateway into Glacier National Park. The Great Northern Railway developed both the classic Rustic-styled passenger station and the adjacent Arts and Crafts/Chalet styled Belton Chalet Hotel in 1909-1910, a year before Congress created Glacier National Park. Architect Kirtland Cutter of Spokane was the architect and the chalet design was actually just a smaller scale and less adorned version of the Idaho State Exhibition Building that he had designed for the 1893 World’s Fair in Chicago. Cutter is one of the major figures of the Arts and Crafts Movement in the American Northwest and we will look at another of his buildings for the railroad and Glacier in the next post about Lake McDonald Lodge. The Cutter buildings for the railroad between 1909-1913 set a design standard for West Glacier to follow, be it through a modern-day visitor center and a post office to the earlier mid-20th century era of the local school and then gas stations and general stores for tourists entering the national park by automobile. me by State Historic Preservation Officer Marcella Sherfy–find the facts, she asked, to show that this three story bunk house, railroad offices, and local post merited exceptional significance for the National Register. Luckily I did find those facts and shaped that argument–the owners then converted a forgotten building into a memorable historical experience. Rarely do I miss a chance to spend even a few minutes here, to watch and hear the noise of the passing trains coming from the east or from the west and to catch a sunset high in the mountains of Flathead County.